Artists' Reception: Fri., Sept. 24, 5 – 9 pm. For a PREVIEW of works by Dorothy Netherland, CLICK HERE. 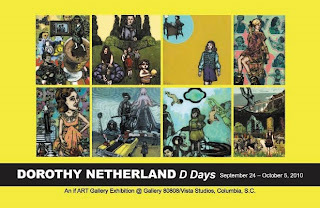 Opening on September 24, if ART Gallery presents at Gallery 80808/Vista Studios in Columbia, SC, two simultaneous solo exhibitions by Deanna Leamon and Dorothy Netherland, respectively called Heads and D Days. The exhibition will run through October 5. The artists’ reception is September 24, 2010, 5 – 9 pm. Dorothy Netherland (b. 1962) will present a new body of work using her unique technique of painting, silk screening and transferring ink onto the back of glass. From memory and personal history, Netherland creates narrative, often symbolic tableaus using imagery mainly drawn from 1950s women’s magazines. Most of Netherland’s paintings consist of two or three panes of glass on top of each other, each layer “carrying” part of the image. The approach provides literal and conceptual depth. Netherland, a native of Alexandria, Va., began studying art in her thirties. In 2000 she received a BFA from the College of Charleston in Charleston, SC, where she lives. 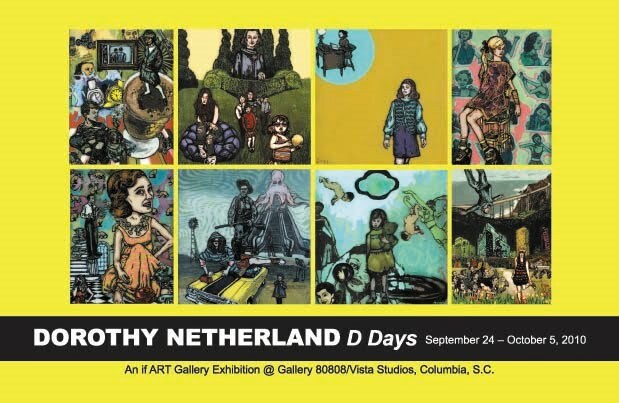 Netherland’s work was included in the 2004 S.C. Triennial at the S.C. State Museum in Columbia. She also was included in the 2004 Piccolo Spoleto Festival Contemporary Charleston exhibition at the City Gallery at Waterfront Park.